The State Wildflower license plate has provided more than $1 million to research the mysteries of Florida's first flowers. Help butterflies and bees - get your tag today. A study in north Central Florida is developing techniques to grow native milkweed for the beleaguered butterflies. This long-term effort seeks to solve the biggest detriment to wildflower plantings and restoration efforts – weed seeds in soil. Learn more. Yellow nut sedge. Photo from Creative Commons. Learn about the students who have been supported by this fund at the University of Florida. In 2013, Nicholas Genna became the first student to receive a graduate assistantship from the endowment. There is still much to learn about growing and managing wildflowers, which have important roles in keeping our natural ecosystems balanced and strong. With the occurrence of wildflowers waning throughout the world, it’s urgent that we discover the best methods of successfully growing, establishing and utilizing these valuable natural assets. Roadsides provide the open, full-sun conditions that many wildflower species need to survive, making them ideal places for opportunistic wildflowers to spring up. The Foundation has documented species along roadsides in several areas of the state, noting their location and abundance. 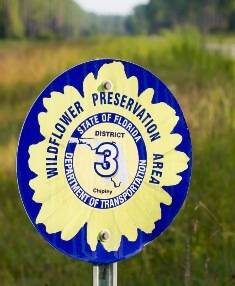 This data is helping to wildflower driving routes with partners such as Visit Florida, the Florida Department of Transportation and individual counties. When managed correctly through reduced mowing, natural roadside provides tourism and educational opportunities throughout the state while feeding butterflies and bees. See driving routes and species surveys. Learn about county resolutions that are saving roadside wildflowers. Milkweed – the only host plant of the beleaguered Monarch butterfly – is in short supply in the Southeastern U.S. This is especially true in Florida, where milkweed hosts a migrating population in winter in North Florida and a year-round population south of Orlando. Florida native ecotype milkweed seeds are difficult to find commercially, and some species are hard to grow. An effort to ethically collect seeds from wild populations to share with native-plant growers. A study of how systemic insecticides commonly applied to milkweed plants in mainstream nurseries effect Monarch caterpillars. A project testing native Milkweed propagation techniques that will develop best practices for the nursery industry. Through the compilation of an index of scientific literature on 290 common Southeastern wildflower species, the Foundation is aiding researchers, natural land managers and nursery growers in finding information that can ultimately boost the success of roadside plantings, habitat restorations and commercial horticulture. This resource has been integrated with the Lady Bird Johnson Wildflower Center’s database to make it widely available across the United States. In its “seed bank,” Florida soil holds rich deposits of seeds of aggressive species. When these seeds are disturbed by plowing or digging, they can rise to the surface, germinate and out-compete wildflower seedlings. Through ongoing research, the Florida Wildflower Foundation is gathering valuable information about controlling the seeds of undesirable species – native and not – that interfere with wildflower establishment. Read more about our weed seed bank research at PEAR Park in Lake County. The Florida Wildflower Foundation will begin a four-year project to evaluate economical and practical site preparation methods to minimize weed competition in wildflower sites planted from seeds, hoping to discover methods that lead to greater planting success.The project at Lake County’s Palatlakaha Environmental and Agricultural Reserve (PEAR) Park will be conducted in partnership with the county with cooperation from the Florida Industrial and Phosphate Research Institute at Florida Polytechnic University. As anyone who has started a small wildflower meadow at home probably knows, weeds can make or break successful wildflower establishment. That’s why the Florida Wildflower Foundation has joined with Lake County on a research project at PEAR Park in Tavares that will experiment with various weed control methods. What specific relationships exist between native wildflowers, bees and butterflies? Can urban landscapes help to promote and protect pollinator health? What are the current threats to our insect pollinators, and how can wildflower habitat help? The Foundation joins with partners that include the Florida Museum of Natural History and University of Florida to uncover answers that can help formulate policy and lead to a better understanding of pollinators and the native plants that sustain them. We also publish a series of articles, “Know your native pollinators,” that introduces our readership to the charming range of bees and other busy beings that call Florida home. The Gary Henry Endowment for the Study of Florida Native Wildflowers was established in 2007 at the University of Florida, where it supports graduate students conducting native wildflower research. The contribution was possible by donations received through the State Wildflower license plate. The fund honors Gary Henry, a retired Florida Department of Transportation landscape architect who established the department’s modern-day wildflower program. Click to contribute a gift to the endowment, please send a check to the Gary Henry Endowment, c/o Florida Wildflower Foundation, 225 S. Swoope Ave., Suite 110, Maitland, FL 32751. Please consult an attorney prior to making your gift to determine its eligibility as a tax deduction. The Florida Wildflower Foundation provides scholarships for master's students studying wildflowers within the University of Florida’s Plant Restoration and Conservation Horticulture Consortium of the Department of Environmental Horticulture in Gainesville. Scholarship students are advised by Dr. Hector Perez, associate professor. Luis Andres Ochoa studies Sand flax (Linum arenicola), a perennial with a small yellow flower and grasslike leaves endemic to South Florida and listed as an endangered species. The Florida Wildflower Foundation provides scholarships for masters students studying wildflowers within the University of Florida’s Plant Restoration and Conservation Horticulture Consortium of the Department of Environmental Horticulture in Gainesville. Tia Tyler, the second of two students supported by FWF, is advised by Dr. Hector Perez, Associate Professor at the Plant Restoration and Conservation Horticulture Consortium at the Department of Environmental Horticulture, University of Florida. The Florida Wildflower Foundation established the endowment in 2007 to provide funds for graduate students conducting full-time wildflower research. In fall 2013, University of Florida graduate student Nicholas Genna became the first student to receive a graduate assistantship from the Gary Henry Endowment for the Study of Florida Native Wildflowers. Genna is studying under Dr. Hector Perez within the Department of Environmental Horticulture’s Plant Restoration and Conservation Horticulture Consortium on the university’s Gainesville campus.